West Campus is where the students are! Rendition of urban rail on Drag from 2000. 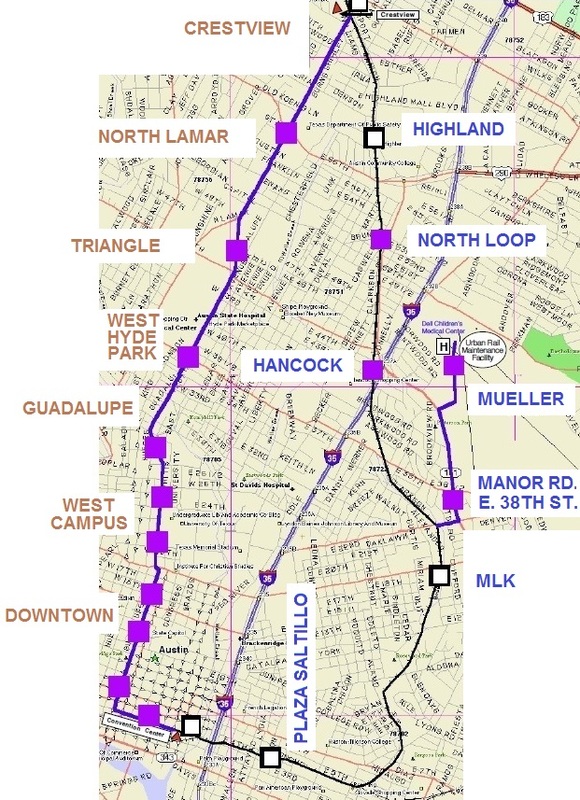 From the late 1980s until the mid-2000s, Guadalupe-Lamar was recognized as the primary major corridor for an urban rail starter line. Graphic: Capital Metro, via Light Rail Now. 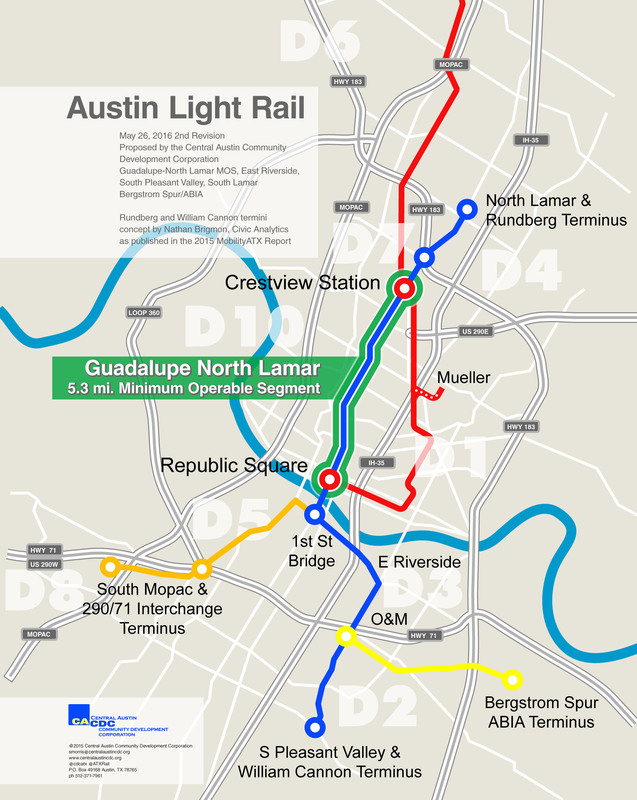 For at least the past 8 years, City of Austin and Capital Metro officials, and the planners and engineers following their bidding, have insisted on plotting a route for urban rail (light rail transit, LRT) along San Jacinto Street, through the relatively quiet, marginal East Campus of the University of Texas campus. Meanwhile they’ve continually dismissed and avoided the high-activity West Campus area, with the busy commercial activity center along the Drag, plus the third-highest-density residential population in Texas, and the intense Guadalupe-Lamar (G-L) travel corridor, ranking as the highest-traffic local arterial corridor in central Austin. Where urban rail needs to be is emphasized in the following map graphic, based on 2010 Census data and prepared by the Central Austin Community Development Corporation (CACDC), a nonprofit headed by Scott Morris (Scott also leads the separate Our Rail coalition promoting voter support for urban rail in the G-L corridor). 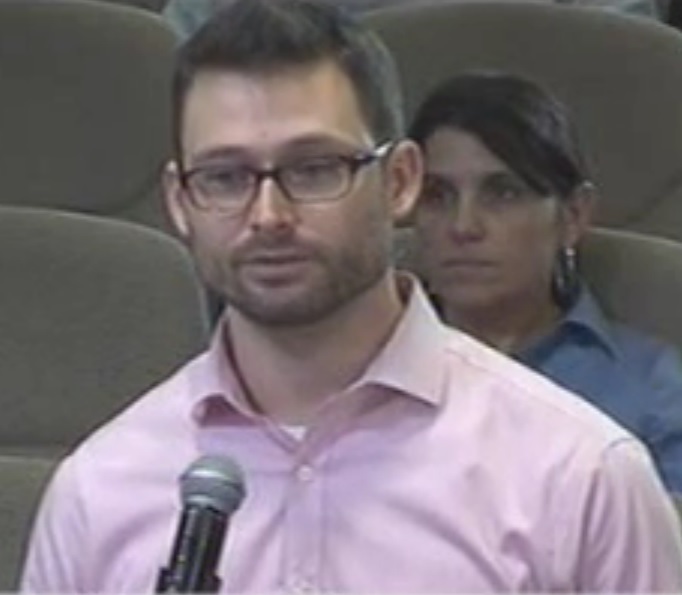 On April 23, 2013, and October 1, 2013 the University of Texas Student Government Assembly passed Resolution AR-5 and Resolution AR-15 respectively, unanimously calling for the Guadalupe-North Lamar Alignment to connect West Campus to Downtown as Austin’s first rail alignment priority. 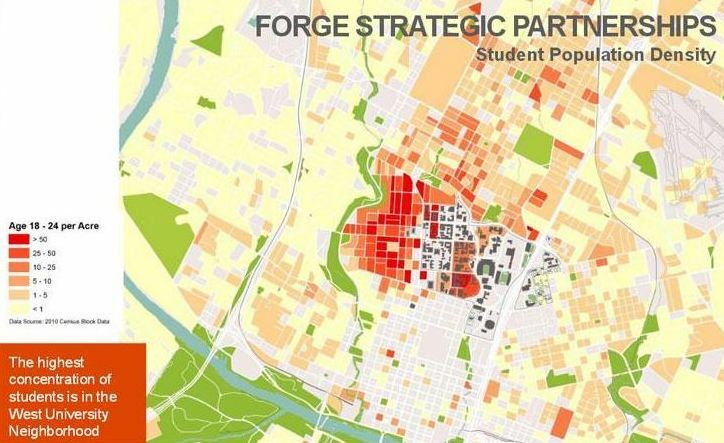 UT students want a connection to their downtown from their homes, not from the east side of campus. 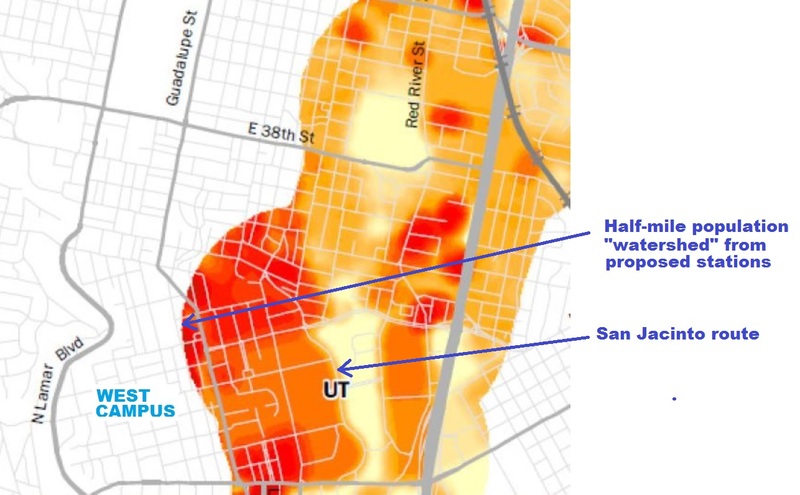 According to new census data, the UT campus and West Campus are among the most densely populated census tracts in the state. Failing to link these neighborhoods to a new rail system would be a disservice to the students who live there — all of whom contribute to the city’s property tax revenue every time they mail their sky-high rent checks. It’s clear that the East Campus route using San Jacinto fails to meet this need. 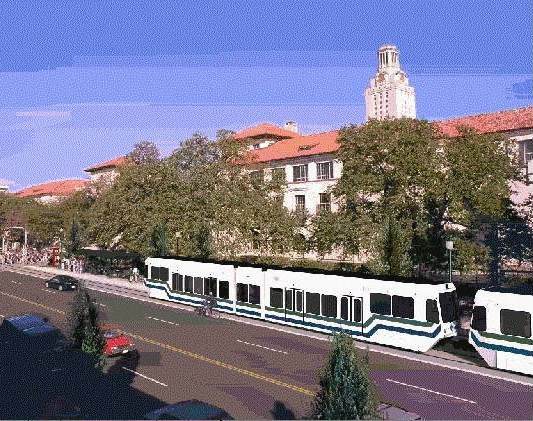 But instead of serving its students — and the desperately more pressing mobility needs of Austin’s population as a whole — UT’s administration has focused on demanding urban rail as a kind of embellishment to its own East Campus expansion plans. This began with envisioning rail as a campus circulator following the decision in the early 2000s to relocate the major campus shuttlebus hub from the Speedway/21st St. area at Jester Center to the East Fountain on San Jacinto near Memorial Stadium. 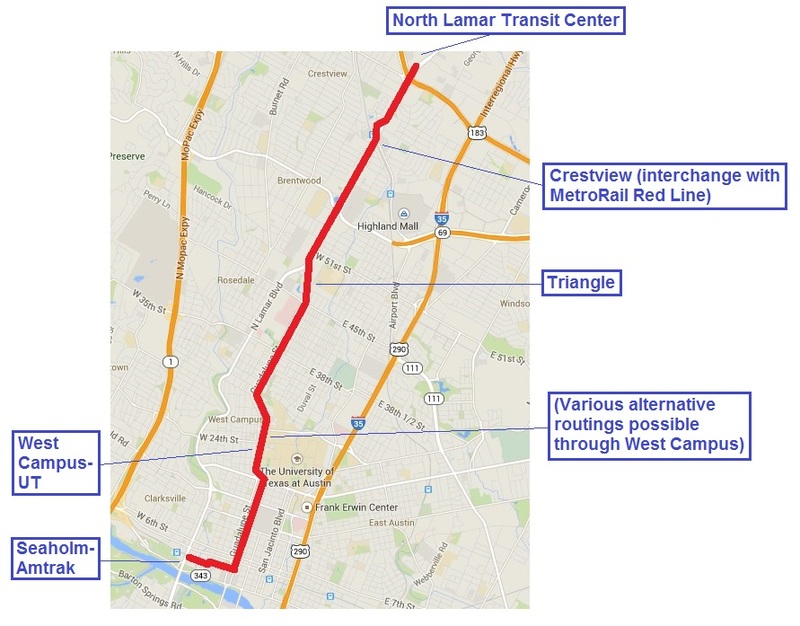 Since then, UT has become increasingly insistent that Austin’s rail planners heed their bidding and keep urban rail’s route planned for San Jacinto. 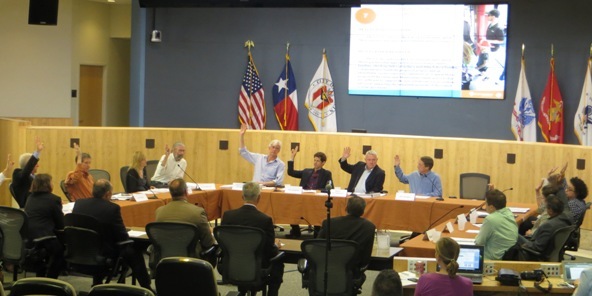 In repeated public statements, UT’s Vice-President for University Operations, Pat Clubb, has emphasized the University’s plans for museums, administration buildings, and other facilities that administrators would like to have served by rail in the East Campus. But an urban rail starter line cannot go everywhere and serve every “nice to have” location or activity point. 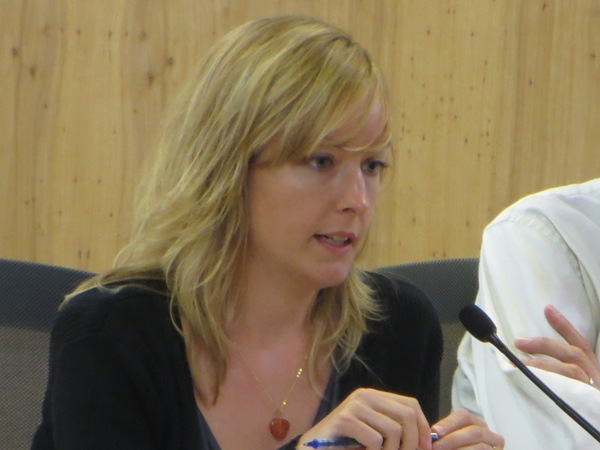 Particularly for a New Start project, it’s crucial for the line to go where the people actually are, where the density is, and especially where the public have been demonstrating, with their own behavior, they want to go. That’s the West Campus and the Guadalupe-Lamar corridor. So here’s a couple of suggestions for UT and Project Connect: (1) Launch a nice MetroRapid Bus Upgraded Transit service for the Trinity-Jacinto corridor and East Campus (current MetroRapid buses could even be relocated for that purpose as urban rail is installed in Guadalupe-Lamar); and (2) If UT’s administration are desperate for urban rail to complement their East Campus development plans, how about they fund and install an eastside branch of urban rail themselves? You are currently browsing the archives for the University of Texas issues category.